Randall Sadler is an Associate Professor of Linguistics at the University of Illinois at Urbana-Champaign, where he teaches courses on Computer-Mediated Communication and Language Learning (CMCLL), Virtual Worlds and Language Learning (VWLL) and Teaching of Second Language Reading and Writing. 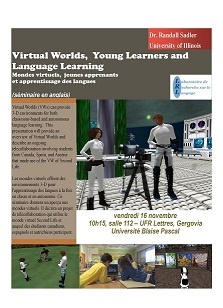 His main research focus is on the role of technology in language learning, with a particular focus on how Virtual Worlds may be used to enhance that process. He has published in these areas in journals including the Journal of English for Academic Purposes, CALICO Journal, and Computers & Education. His latest book, Virtual Worlds, Telecollaboration, and Language Learning : From Theory to Practice will be published by Peter Lang. He is also the co-owner of the EduNation Islands, which are located in the Virtual World Second Life, where he may often be found in the guise of his avatar Randall Renoir.